While I was at the nature reserve looking out over the canal for yesterdays post, I came upon a couple of these structures. Seems they are nests. I don't know if any creature actually uses them or if they are wild art. I'll pop back in a month or so and see what happens. When buying my bird feeders at the garden centre last week, I saw some of those prefab nests. They looked lovely and I was tempted to buy one for flower arranging. What a perfect nest! Hopefully it will make a very happy home for some birds! It will be interesting to see what you find out. 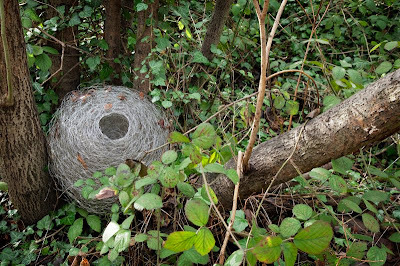 It is such a perfectly shaped nest. 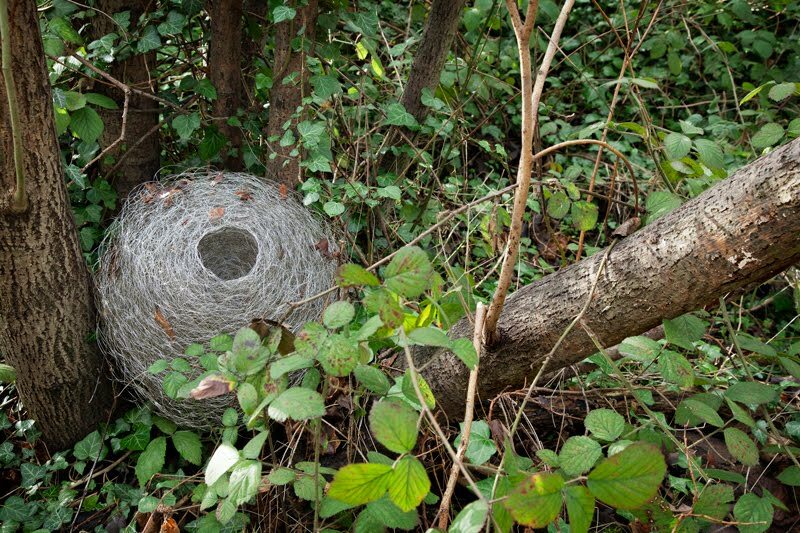 At first glance, I thought it was an old wasps nest. What a perfect shape. I shall be interested to see what you discover. Someone will move in soon enough. Very pretty objets d'art. Perhaps you'll come back and find they have been filled with flowers! I assumed they are wild art till I read the first comment. Isn't it a bit big for a nest? Intriguing. IT looks like a giant empty silkworm cocooon. I wonder if a bird would actually use that? Can't wait to see what you find out.